Thel Aydin Bey King's Palace is situated in Evrenseki, centre of is Side just 15 km, Antalya airport 60 km away. 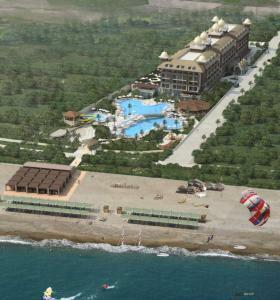 Reception, main restaurant, a la carte restaurants (Ottoman, Mediterranean, Asia), 5 bars, Irish pub, Café Turk, 2 outdoors pools with children's section, indoor pool children's section, meeting halls, shopping centres. Daily activities, animations, cooking courses, special gala party once in 2 weeks,Turksh bath, sauna, jacuzzi, fitness, table tennis,darts, beach volleyball, boccia, step, gymnastics, aquapark miniclub (4-13 age), mini library, wireless internet in lobby. Billiards, bowling, internet café, computer games, masage, beauty center, water sports, jeep, car, bike, motorbike rental, laundry, room service, bottled drinks. Telephone, satellite TV, mnibar balcony, safety box –free, bathroom. Late breakfast, snacks, coffee&cake, midnight snack. Fruit buffet, ice cream in certain time.